Human well-being and sustainability : is there a solution to ill-being ? Here it is the follow-up of my previous article entitled “Human well-being and sustainability : the human determinants of change”, where I present you the second part of the article by Gerhard Frank on human well-being and sustainability . « Cultural sustainability without any doubt is grounded in human experience and behavior. Some people are on a journey of exploration to develop increasingly sustainable lifestyles, whereas others are not. Hence the question of global resource use cannot be exclusively reduced to technological solutions and their political constraints. It also has to take the human condition and its successful change towards an appropriately adjusted, green life style into account. Sustainability is a matter which has economic, political, technical and human implications. Learning to act in a sustainable way is an educational issue. We have to educate ourselves towards a green attitude. But what does this actually mean ? If education is the key to a sustainable life style, which type of education do we intend to establish ? Modern education predominantly deals with rational understanding. To learn means to learn to do things in a logical way ; logical in the rational sense. Western school curricula emphasize on a scientific i.e. rational kind of knowledge. Is this type of rational education sufficient with respect to a global problem that has at least partly resulted from an ecologically inadequate life-style ? Do life style issues not go far beyond the pure rational aspect of human life ? And as a consequence of this, shouldn’t we rather develop a more holistic approach instead that includes additional human aspects such as our emotions for instance ? ». Dr Gerard Frank argues that any human experience consists of five different experiential domains that interplay between each other : emotional (feeling), mental imagery (mental narrating), sensorimotor (acting and perceiving), linguistic (rational reasoning) and communicational (conversing). « Human experiencing is always a multi-layered, multidimensional event whose outcome mainly results from the innate, self-organizational interdependencies of the human systems or human beings involved. To leave out these systemic interferences means to ignore the importance of the intrinsic, mutual interactions that both typify and specify human experiencing ». And he carries on illustrating an historical example to not repeat the same mistakes in our society, and try to find solutions for the irreversible decline of fossil resources, overpopulation and environmental pollution. « From our historical records we learned that the transition from the European dark ages into the European modern world was an unplanned event. No one was planning to deliberately transform the society s/he was part of in the way it was then transformed historically. Three important differences at least distinguish the pending transition from its medieval predecessor. This time it will be a global affair. It appears to be the first time in human history that we consciously experience and know about the change itself. Because of many different reasons people of the Middle Ages were not able to perceive or understand the societal circumstances or to anticipate their future in a way the modern human being can do in principal. Highly sophisticated communication technologies have spread globally, enabling us humans to communicate ideas, concepts and information globally, effectively and immediately. Everyone can participate in a change process at any time. Human well-being and sustainability Part2 : is there a solution to ill-being ? The consequence I want to draw from these unprecedented differences appears to be conclusive : this time we humans have the ability to jointly and consciously choreograph the societal change that is about to happen. The technologies to coordinate this process globally do exist. The awareness regarding the process itself does exist. Although today the risks of not changing are far greater than ever before, we literally have the obligation to intentionally take care of ourselves. There is no excuse if we do not proceed. 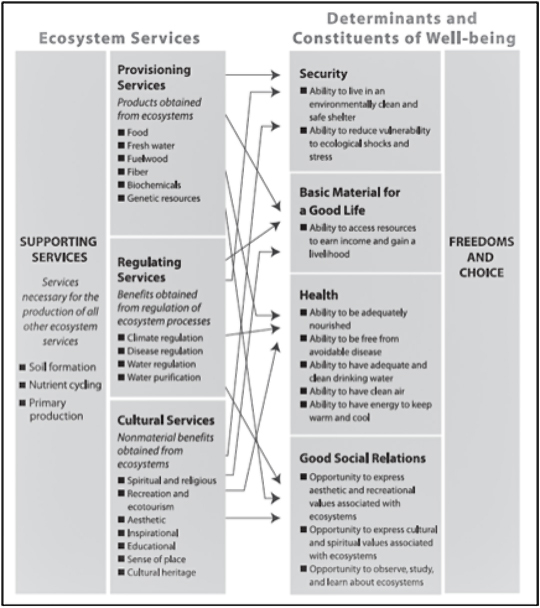 Figure 1│ Ecosystem services and their links to human well-being (Figure modified from ). The human species can, if it wishes, transcend itself — not just sporadically, an individual here in one way, an individual there in another way, but in its entirety, as humanity . Taking care of ourselves in the proposed manner does not mean to impose solutions in an undemocratic way. On the contrary, a choreographed societal transition process could be based on a sound scientific methodology that everyone can understand and share globally. This could give humanity the opportunity to jointly participate in a democratic and historical movement. The danger of undemocratic occurrences lies in an approach that among others ignores the idiosyncrasies of the cultures, cosmologies and cognitive styles of the communities involved. This can be avoided if the process is based on a holistic understanding of human experiencing that includes emotional, spiritual, social and other human aspects as well and does not reduce it to exclusively rational issues. What is urgently needed is a holistic knowledge base that enables us to flexibly and creatively deal with cultural and personal differences and to make use of these differences instead of ignoring or even misusing them » . G. Frank, « Becoming sustainable : Human determinants of change., » Science of the Total Environment, vol. 481, pp. 674-680, 2014. J. Huxley, Transhumanism. New bottles for new wine., London : Chatto & Windus, 1957, pp. 13-17. VV.AA., Ecosystems and Human Well-being : A Framework for Assessment., Washington, DC (United States of America) : ISLAND PRESS, 2003.